One woman drops off a gift box at French City Baptist Church to be shipped with other Operation Christmas Child gifts. 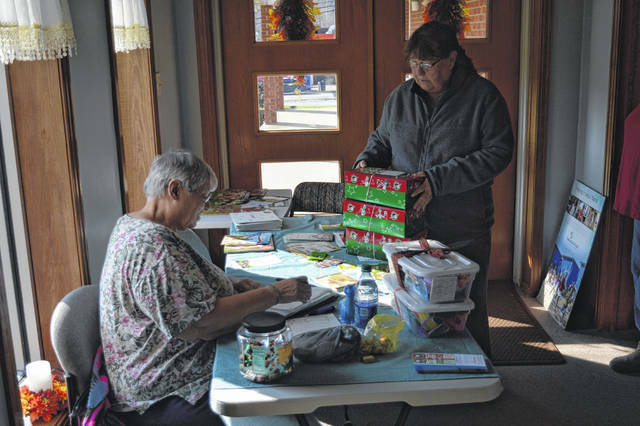 GALLIPOLIS — French City Baptist Church has approached roughly a decade of giving while serving as a drop off location for Operation Christmas Child. Williams said families who receive gifts are invited to come to a 12 lesson Bible study called the Greatest Journey at a pickup center. Williams said items often packed were meant to help with everyday life and may include things like toothbrushes, shoes or a shirt and a toy. Samaritan’s Purse was started by Franklin Graham, son of Billy Graham, said Williams, and Operation Christmas Child is one of Samaritan’s Purse’s ministries. “Every year we’ve had like a thousand to 1,400 boxes for the last seven years,” said the pastor. The church collected gifts from Nov. 12 to Nov. 18. Then after, gifts were loaded onto semis in South Point and shipped on their way.